Suit up and get ready for battle! 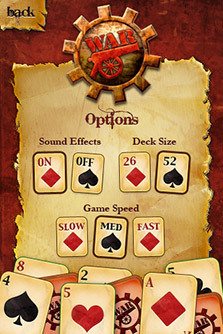 Now you can play the classic card game War on your iPhone or iPod Touch. You start with a stack of 26 cards. 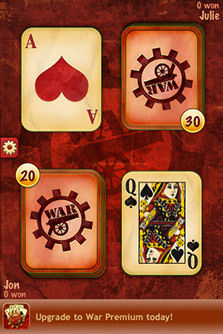 The object is to capture all of your opponent's cards through a series of battles in which the high card wins. The real excitement begins when you and your opponent reveal a card of the same rank. 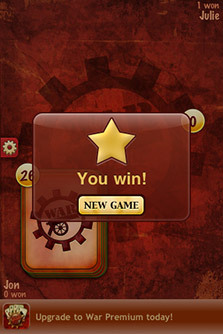 A war ensues giving you a chance to capture many of your opponent's cards at once! 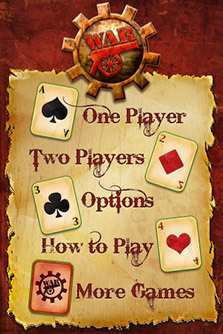 War Free supports one player and two player gameplay, so you can play head-to-head against a friend or take on the computer to see who can capture all of the cards first. 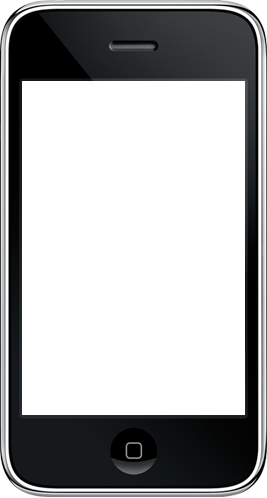 If you're looking for an exciting and competitive way to kill some time, this is the game for you!